Among the many kinds of planers in the market, Makita KP0810 7.5 Amp 3-1/4 inch Planer is my personal choice mainly because it is designed for a high-quality performance and convenience of use, especially for a non-professional user like me. Its 7.5-amp power motor is capable of carrying all sorts of wood applications thus I know whatever material I will be using, I can count on this power tool to be able to do the job. This is just one of the many features of this planer, hence this review aims to give you details and information about this tool and help you determine why this can be the best bet for you. Woodworking, though known as a professional job can also be a hobby that is both enjoyable and useful at the same time. It may be an uncommon choice for a pastime, as it is more likely to be considered a job, but fixing and building things is something that I have been interested in for some time now. It is also the fact that DIY’s are also a thing now, hence it is a good way to make yourself useful as well. The secret to creating and building is having a power tool that will help you realize all that ideas in your head. And it shouldn’t only be just any tool that you immediately see upon searching in google. It should be top quality and also has top notched features so you can use it in any application. I know that with Makita KP0810 7.5 Amp 3-1/4 inch Planer, you can have this and more. Makita KP0810 7.5 Amp 3-1/4 inch Planer is actually built and engineered for a professional setting. Its high power 7.5 amp motor allows efficient use of it in construction framing, window and door installation, and fine woodworking. However, it can also be a useful tool for home use because it is easy to operate and the high performance will allow users to use it effectively and efficiently for any DIY projects. In searching for a good planer, it is important to have a checklist of the things that we should consider before making a decision. After all, it is not merely a simple question that only requires a Yes or a No answer. It needs to be thought about, scouted and carefully selected because buying the best kind of planer is already an investment in itself. Before buying a planer, it is essential to know first the purpose and the kind of woodwork you will be working on so you will know which planer can and cannot do the job, and eventually let you pick one that fit to do the work with flying colors. Each planer have certain limitation and level of performance thus you have to prudently check each one. When checking for different planers, one aspect that we ought to know about is the planer’s capabilities and limitations so we can choose one that is capable of doing the job that is required. Power and speed is one measurement of the overall functionality and efficiency of a top quality planer. Each planer is equipped with different features that increase its performance and effectiveness. This pertains to the solid construction and how a planer is able to withstand frequent and long-time use. It is important for any power tool to be made with powerful and sturdy material as well because it is designed to do hard and heavy work. Choose a planer that has an increased functionality and can manage any type of wood work. Because you will never know what you would be working on next, a planer that you know can carry anything even the heavy work will be a great advantage. Makita has been a known worldwide brand and manufacturer of a wide range of power tools with exceptional and advanced features that is engineered to be used in any professional settings. 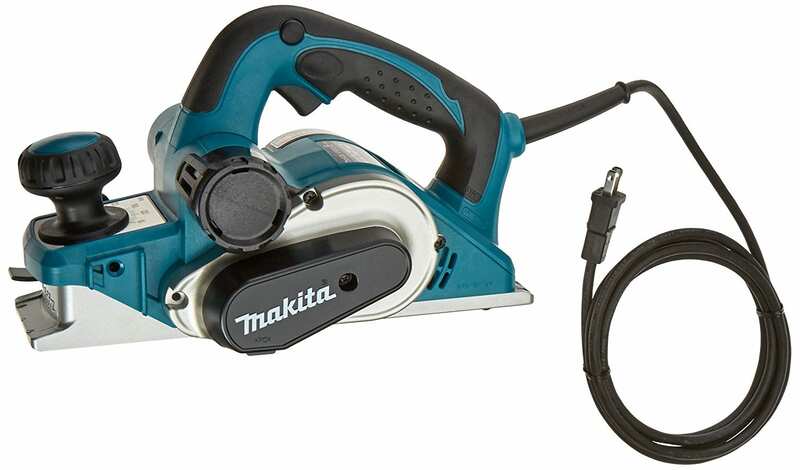 From among these different top notched models, this Makita KP0810 7.5 Amp 3-1/4 inch Planer is also built with the same energy efficiency and quality of output. Its 7.0 amp power motor allows it to be a reliable tool for all smoothing applications including hard material and edges. It is also equipped with other features that make it a preferred choice. This model from Makita is designed to fit the need of a good planer that can withstand the demands in a professional environment. With a 7.5-amp power motor and 16,000 RPM of speed, it has higher capabilities than most regular planers. This feature also allows it to be useful in cutting and smoothing heavy duty objects efficiently. This makes it ideal for continuous and prolonged work and in any kind of wood applications. It is built with double edge carbine blade for added performance, which can plane up to 3 ¼” wide and 5/32” deep in a single pass. It is designed with an ergonomically centered balance and rubberized front and rear handle for an easy and soft grip, long resistance to exhaustion, and for a more comfortable operation. With a depth adjust knob, it became easier to read the scale for a more accurate control and precise planing. It comes with a lock on-off button conveniently located for a continuous operation. With this, you will be able to set and lock the setting to how you need it which will result to a consistent and accurate planing. Aside from those mentioned, this planer also has other features such as the spring loaded stand that elevates the base to protect the blade, chip ejection, and easy blade installation that will help improve the performance, productivity and output and the same time promote comfort and convenience. As part of my search for the best planer, reading about what other people has to say plays a huge part as that for me determines the actual performance of the planer if it meets what is says to be capable of doing. Makita KP0810 7.5 Amp 3-1/4 inch Planer has given its users reasons to be glad about it as it has been raving with good reviews and performance evaluation. Perhaps the only downside about this planer is the lack of dust bag and storage that comes with the planer kit. Without the dust bag, literally, your work area will be raining with flying saw dust while using this planer. The lack or storage case or bag is another concern, which though may be minor but would have been convenient to its customers. Customers particularly like the high powered motor and the smooth finish of this Makita planer. One customer also pointed out how great this power tool is in cleaning sawn edges, eliminating sanding and expediting the process. The knives last after few uses, and still razor-sharp as compared to others they have tried before. Safe to say, they were all happy and would even recommend purchasing this planer. To give a brief comparison of this planer with the others that are also available in the market, here are five other options for you to check as well. This WEN6530 6-amp Electric Hand Planer provides up to 34,000 cuts per minute. Designed to be lightweight, this planer only weighs around 8 pounds, thus it has an advantage with it comes to holding and handling a planer as compare to others. It has 16 positive stops with a cutting depth from 0 to 1/8 inches. This planer is built with a v-shaped groove on the base plate to help flatten sharp corners. Aside from the planer, the package also includes a dust bag, a rabbeting guide, a kickstand and parallel fence bracket. Powered by a heavy-duty 6-amp motor, this planer has over mold depth knob with 10 positive steps. It is designed with a dual-side dust extraction allowing extraction on either side of the tools, increase productivity and convenience of use. It provides smooth cutting of wood, metal and other hard materials with a max speed of 16,500 RPM. This package comes with a carbide cutting blades, wrench, dust bag, edge guide and kit bag along with the planer. This planer is designed with a two-blade cutter head that has a maximum speed of 17,000 RPM to give you a fast and smooth finish. It is also equipped with double edge carbide blades for improved performance and productivity. It is capable of cutting planes up to 3 ¼’ wide and 3/32” deep in just a single pass. It is built to have an outstanding and efficient performance, as it is powered by a 6.5-amp motor for a higher output. Installing the blade is no hard job with the easy blade setting that it is designed with. This planer doesn’t fail in performance and efficiency as well as compared with the others because it is also powered by a 6.5-amp motor and a speed of 16,500 RPM. This planer is considered to be the very first to have the ambidextrous lock-off release button for added safety when using. It is designed with an aluminum front and rear shoes precision-machined together to ensure accuracy. This machine is thoughtfully built for outmost safety as aside from the lock-off release, it also has the spring-loaded stand elevates tool to protect the blade and tool resting spot. It is, however, a little heavy, weighing 14 pounds. Built to be highly durable and easy to use, this planer assures speed and smooth finish even on the hardest wood with a 7.0 amp motor power and 15,000 RPM. It is capable even with large sharpened high-speed steel blades for straight edging and some framing applications. At the same time, it can accept reversible carbide blades for more detailed and precise woodworking. It is designed with a precision machined shoe bottom and side to provide a flat and accurate finish. This planer is definitely ideal for heavy work and using of heavy materials. A choice for a portable planer may depend on its varying functionality and usage. Though others may prefer a simpler and basic model that can just do the job, others may want specific features and high-performance capabilities, again depending on the purpose of how you will use this planer for. But then ultimately we choose one that is solid, functions very well and comfortable to use. Makita KP0810 7.5 Amp 3-1/4 inch Planer is no doubt a powerful planer and engineered to be a professional fit to any kind of job. Though it is mostly ideal for a rigid and heavy work, it is still a favorable option for home use because of those same reasons. It is a handy tool that you know can carry most of the planing work in various kinds and applications that we may not anticipate in the long run. It is also convenient, safe and easy to use and a definite good value for your money.